Double or Twin share cabins. 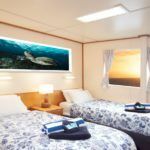 Five of these cabins contain a double bed with a single bed over the top, bunk style, however one cabin contains just a double bed, so be sure to advise your preference for double or twin share when placing your booking. 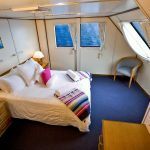 These cabins are located on the lower deck, are fully air-conditioned and also contain a wardrobe, bed side table and private bathroom. 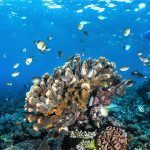 Scuba dive the Great Barrier Reef’s Cod Hole & Ribbon Reefs. 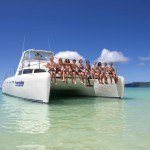 Dive with the sharks at Osprey Reef 200 km offshore in the Coral Sea. 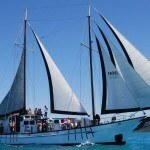 Our vessel, Spirit of Freedom takes you on a Liveaboard Coral Sea – 4 Day tour in style. 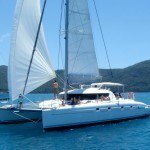 This sleek and spacious vessel offers quality liveaboard tours to Advanced certified scuba divers. Over your 4 day, 4 night adventure you will have the opportunity to complete up to 15 scuba dives. 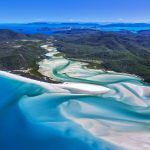 Your trip begins with a one hour scenic flight from Cairns to beautiful Lizard Island. 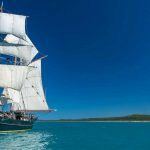 Located in the heart of the Great Barrier Reef’s Coral Sea. All diving activities are overseen by the Trip Director. They will be the one to brief you on each dive and ensure your diving experience is both safe and enjoyable. Don’t have 4 nights to spare? Click HERE for another great tour to Cod Hole. Pickup from your Cairns City Accommodation at approximately 7.30am. Head to Cairns General Aviation Airport. Then your scenic flight up the coast to Lizard Island. After Boarding and orientation of the vessel it is time to depart for Ribbon Reef No.10. In the afternoon you will have the opportunity for 2 dives at a choice of sites. Including Lighthouse Bommie, Pixie Gardens, Pixie Pinnacle and Challenger Bay. These two days are spent diving Osprey Reef (weather permitting). With amazing landscapes of sheer walls laced with gorgonians, sea whips and bright yellow soft corals. The dive site North Horn, is at the tip of Osprey. You will find the beautiful Grey Reef Sharks and the Silvertip Shark . 4 to 5 dives are available each day including a night dive on the Friday. Ribbon Reefs No. 3. 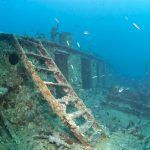 You will be diving at sensational Steve’s Bommie, Temple of Doom and Flare Point. 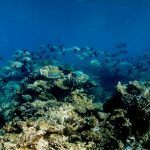 If there is good weather conditions you may head south to the choice dive site “Bougainville Reef”. 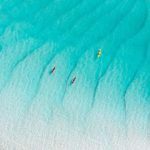 With its abundant marine life and spectacular coral overhands, tunnels and sheer drops and partially submerged shipwreck. 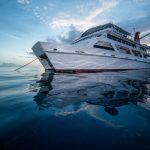 During the evening you will cruise overnight back to Cairns. Arriving back in Cairns at approximately 6.30am. Enjoy a light breakfast onboard and a group photo opportunity. You will be dropped back to your Cairns Accommodation around 8.00am. This Itinerary is a sample only and sites may vary or change due to weather conditions. Advanced Diver Certification. With a minimum of 20 ocean dives. Including 5 dives in the last 12 month. Less experience may result in limited diving due to environmental conditions and remote isolation of dive sites. * Please inform of any specific dietary or other requirements upon booking. Please read the ‘policies’ of your tour below prior to booking, including terms and conditions.